I’m sitting with my wife on the hard, greyish-brown surface of the Black Rock Desert in Northern Nevada watching the final minutes of Burning Man 2013. It is the traditional Temple burn, an event viewed by thousands in solemn silence. Burners honor this building with quiet reverence because it is the spiritual center of Black Rock City. Most burners have been inside the Temple and left notes of love, forgiveness and farewell. The Temple tugs at your heart with a sanctity that belies the “party on the playa” reputation of Burning Man. But in truth, Burning Man is a balancing act among the many and varied aspects of life – surviving, creating, playing, praying, loving. There’s no simple way to explain this event. Our vantage point for the Temple burn is the best we’ve ever had – thanks to our son, who works year round organizing and managing the Temple Guardians, a group crucial to safety and sanctity of the Temple. As fire begins to lick at the base of the pyramid-shaped structure, we come face-to-face not only with the end of this hallowed building, but with reality: the magic of Burning Man is nearly over for another year. The fire quickly erupts into massive flames shooting out the sides and top of the Temple. 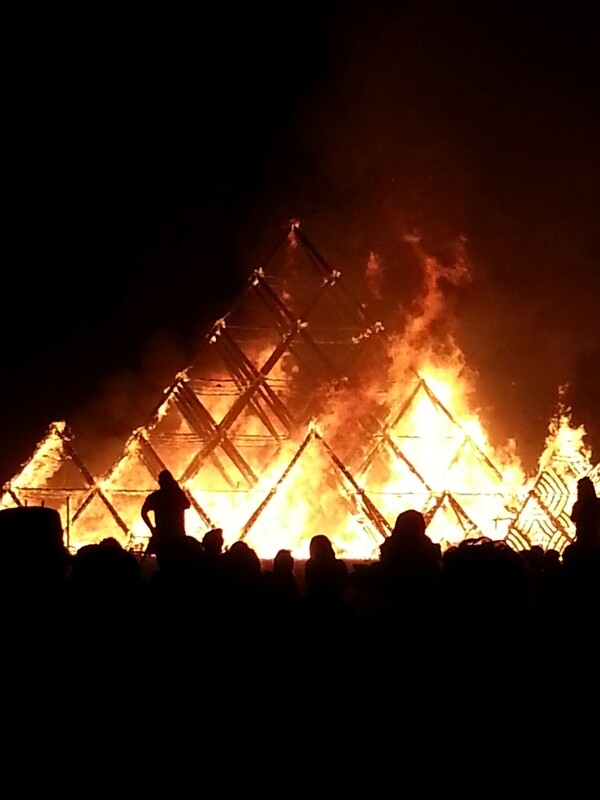 The structure – more wholes along its four slanted sides than solid wood – is designed to burn with ferocity. We have to move back because of the intense heat. Getting up from our roost on the Playa isn’t easy – we’re both getting older and our muscles are becoming somewhat like the Tin Man’s joints in the Wizard of Oz. But we manage – just as we manage everything we do at Burning Man, which includes a lot of hard work for our village, and riding our bikes for miles across the Playa to view artwork, attend programs, or get in line for free … well, you name it: grilled cheese sandwiches, root beer floats, martinis. Burning Man’s gifting economy is just that – you don’t have to trade money or anything else for what is offered to you on the playa. But now our eighth trip to Burning Man is winding down. We’re already packed and ready to leave the desert as soon as the Temple burn is over. We know we’re facing hours of tedium waiting with 10s of thousands of vehicles to squeeze down from the seven exit lanes leading out the gate onto a single lane of rural Nevada highway that snakes some 80 miles southwest to I-80 near Reno. But it’s all okay. It’s been a fantastic week. As often as we’ve regaled people with our stories of the pleasures of Burning Man, our friends still wonder why we trade our easy Lincoln lifestyle for a trip into the harsh environment of the Black Rock Desert. I wonder each year too. Am I too old for this, will it still be fun, can I handle the physical stress? But upon arrival I know I’m exactly where I should be. I feel younger and more alive than at any other time of the year. It’s part of the magic of being a Burner – no matter how old you are or believe you are. But it does take a couple of days to shuck all of my real-world anxieties and begin to see the wonder of Burning Man. People have come out to the desert with art that they want to share with me, and all I have to do is open my eyes and take it all in. I put one foot in front of another and go out to help with the ceremonial lighting of the city. As a part of Lamplighter Village, we’re responsible for hanging nearly 800 kerosene lamps along Black Rock City’s major thoroughfares every evening, and retrieving them in the morning. 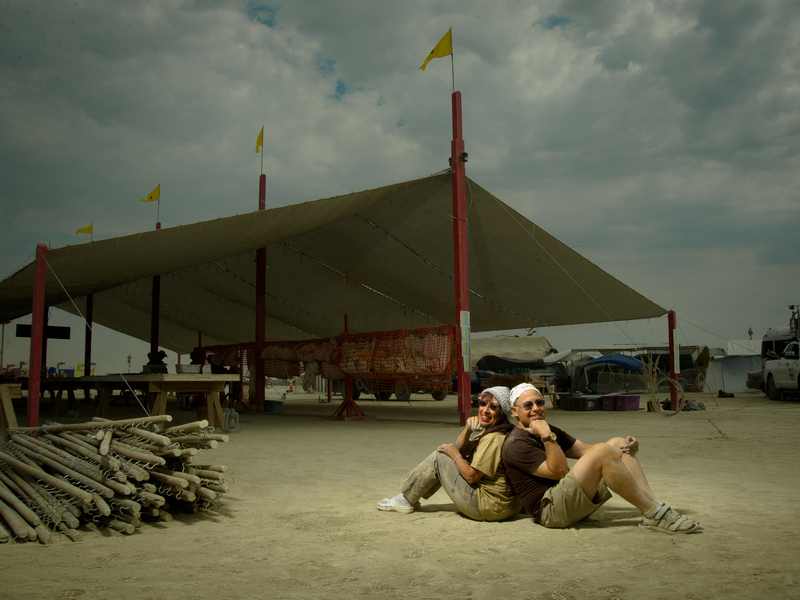 Alan and Judie (Perky and Lashes) in front of Lamplighter Chapel, the group’s workspace at Black Rock City. Astounding. I can still actually handle the job; it feels good to walk the playa, accomplish my task and look back to see the lighted streets. We don’t seem old or weak to others in our village – they look up to us, and want our help and advice. And our playa friends energize us with the love and joy they bring to Burning Man. What could be better? You see the true wonder of Burning Man only after dark. Despite the absence of an electric infrastructure, the playa looks like a lighted carnival. There’s fire everywhere, a disco roller rink, a pedal-powered bumper cars ride, Thunderdome where opponents bash each other with rubber mallots while hanging from a geodesic dome. Hundreds of art cars roam the desert taking such forms as a fire-spewing octopus, a disco blaring sailing ship and the omnipresent cupcakes. People wear colorful costumes that are illuminated for visibility (some just wear lights and forego any clothes at all), and they ride bikes festooned with lighted fenders, wheels and handlebars. Then there’s the art. Truth is Beauty – a metal and mesh sculpture of a woman – soars hundreds of feet above the playa. She is breathtaking. A garden of fiery mushrooms grows out of the inhospitable land. Sacramento’s own Playa Queen – a wooden, hand-crafted paddle wheel steamer – looks for all the world like it’s making its way across the desert surface. The Man itself is perched above a massive three-story building shaped like a flying saucer. Unless you’ve been there, this event is unimaginable. When you’re there, it’s almost too much to take in. Labor Day morning. We wend our way down the narrow highway toward home, passing Pyramid Lake on our right, and stopping for breakfast at a Sparks diner. There we see two contrasting groups of patrons: Burners, full of playa dust and happily chatting up their Burning Man stories; and Others, amazingly clean, grumpily awaiting their morning coffee. Never is it so clear that Burning Man has changed your life.